A steep slope in your Newport Beach, CA yard might seem like an impossible place to fit a pool, but with some clever engineering, it is possible - and can look fantastic too! If you’re thinking about putting in a pool, but are not sure if you have enough level ground to do it, or if you’re wanting to take advantage of the effect a slope or view can bring to your pool, be sure to keep reading. The first thing that needs to be added when installing a pool on a hillside is a set of retaining walls engineered to hold back the sloping ground. A single wall is often enough, but in extreme cases, or where a more gradual sloping effect is desired, several levels of terracing may be added. Each retaining wall is cantilevered to ensure it is strong enough to bear the weight of the sloping ground pushing up against it and protect your pool once it is installed. The retaining walls themselves are a decorative opportunity for your yard with building materials including natural stone and veneered concrete blocks. Retaining walls also present a windshield for your pool and vertical surface for installing lighting fixtures. 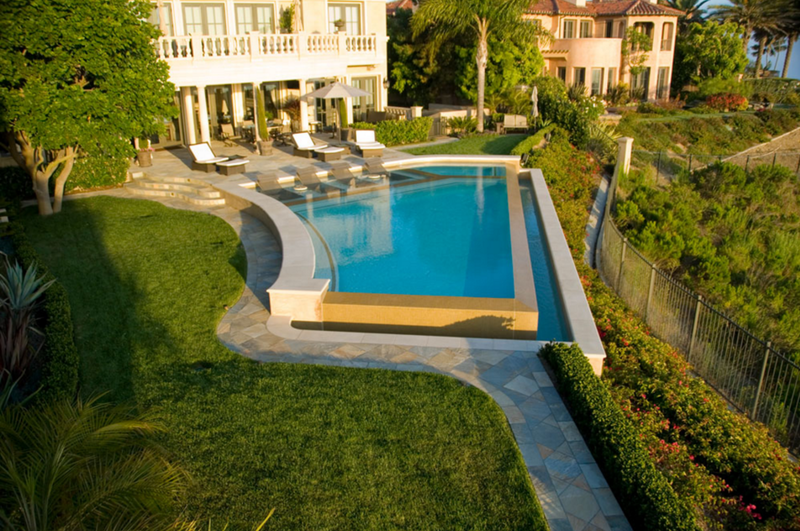 Where the ground slopes in towards your backyard, your pool will literally appear to be carved out of a hillside. This effect can be enhanced by having the back wall of your swimming pool extend into the retaining wall. A pool carved into the a hillside in this way is wind protected and includes a great deal of privacy. On smaller slopes, less extreme measures are needed to hold back the slope but the same effect can be achieved. Depending on the design and the slope of your yard, another way of achieving a level foundation for your pool is to add ground to the lower part of the slope and build it up. In this way, the topography can be remodeled to make it better suited. This process can take some additional time, as the ground needs to be compacted and left to settle before it can be built upon. In cases where the yard slopes away from the house, particularly where it gives way to a breathtaking view, an infinity pool is possible and is recommended in order to take advantage of the view. Here, a section of the pool's upper edge is removed to allow the illusion of a seamless transition from water into the surrounding landscape. The water spilling over the edge is caught in a spillover catch and recycled. In the case of an infinity pool, and even where a spillover is not included in the design, portions of the pool remain above ground. These portions can then be veneered to match the surrounding hardscape. Alternatively, the edge of the pool facing the view, where it is entirely exposed, can be cast from glass to create a stunning modern design. A slope leading down towards your pool can be taken advantage of by turning it into the setting of a rocky waterfall feature, or simply by taking advantage of its natural height to add landscape lighting and lighting for your pool area. RELATED: NATURAL STONE OR DECKING FOR POOLSIDE SURROUNDS?